Yesterday evening I returned home from more than two weeks in British Columbia. 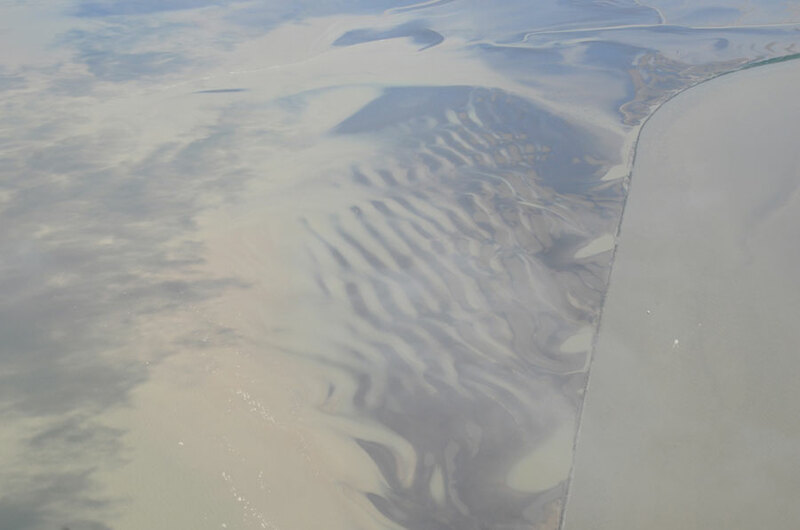 I was fortunate to have the window seat during the departing flight from Vancouver and managed a few quick shots of the rhythmic landscape of low tide. Stunning shots, especially that first one. Thanks. Thank you for your kind words, Elizabeth. Ah yes, the Fraser River delta – I flew over there this time last week, but did not think to take a photo. I hope you had a great time and that we get to see photos from the Okanagan and other places you visited. 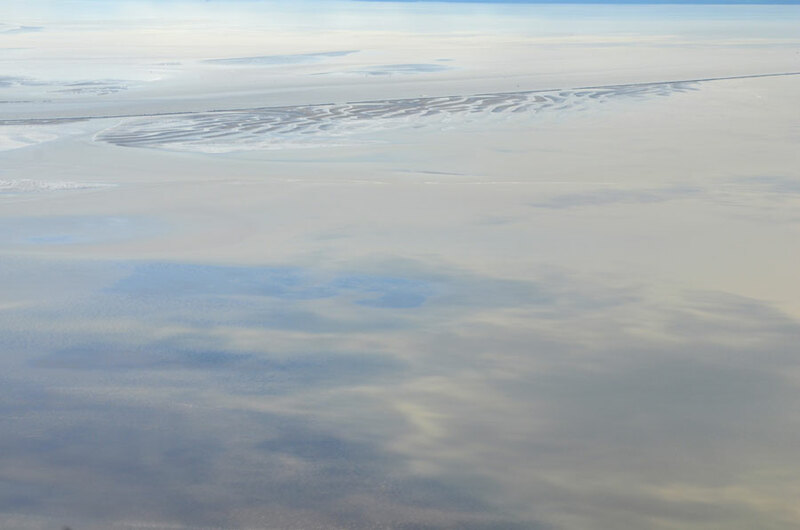 Interesting paleoenvironmental fact – this delta occasionally has a major underwater landslide off its leading edge. 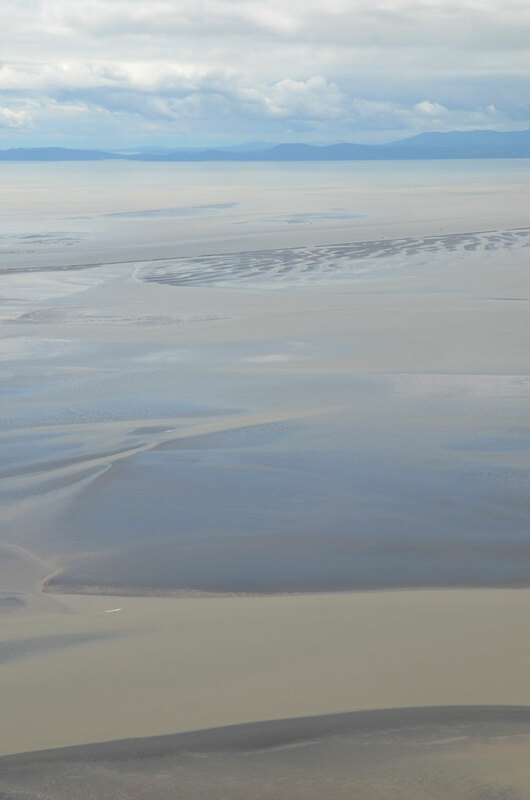 This has resulted in tsunamis, with sediments from the waves lodged as high as 30m above sea level on the shores of the Gulf Islands that face this way. The wave, much reduced in energy, then reflects back to the delta, presumably running over the lower elevation areas, like Richmond, Delta and Tsawwassen. Let’s hope it does not happen again. I was just peeking at your Kilgii Gwaii archeological posts and am looking forward to reading them all. What a fascinating thing to do! That is quite interesting (and a little scary!) about the underwater landslide. Thanks for writing that. Ah, Helen, you are very kind! What an exciting come back, Karen! I’m so glad to see your beautiful serene paintings again! Marina, thank you. I was thinking these looked rather painterly also. I prefer the opening image but they are all very serene. stunning, incredibly clean images. as you have accustomed us to. Great to have you back, your images always lift my soul! Thanks, Cath. I’m happy to hear that! Thank you, Nandini, I appreciate that! I always take so much pleasure visiting your blog. You are so very talented. You are very kind. Blush. These are lovely, Karen. Great subtle colors. I love seeing the landscape from above, following rivers, mountain ranges and all. Hi Lois, thank you! It is fascinating to see the world from above. Everything is already said. Glad to see you back, Karen! Flight offers that rare opportunity to experience a detached, otherworldly, dreamlike state and you have expressed the condition beautifully. Louis, thank you. Flight does offer quite a different perspective. Welcome back, I think we have all missed you ! 🙂 Lovely images, nicely abstracted. I too read magazines backwards, being left handed it’s more comfortable that way! It is nice to be home, actually. Thanks, Marina. Were not the only ones, apparently! What a nice thing to say! Thank you so much. Looks very surreal – the tracks of water in a subtlety of line and form. Wowee! Beautiful photos especially the first one. Hope you had a great trip. Missed your tranquil, georgia o’keefe like photos while you were gone lol. I’ve recently seen (for the ten thousandth time) the film Point Break. It resembles the scene in which they jump out of a plane with parachutes.